Find and compare the best prices from a range of well known car rental companies at Luxembourg Airport. This is a free to use facility, enabeling you to book direct with the company quoting the price. Luxembourg airport has two terminals, Terminal A (opened in 2008) and Terminal B (refurbished in 2017), the latter being used for smaller aircraft. 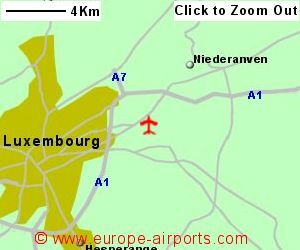 There is a bus service between the airport and Luxembourg central station approximately every 15 minutes during the day (every 30 minutes on Sundays). 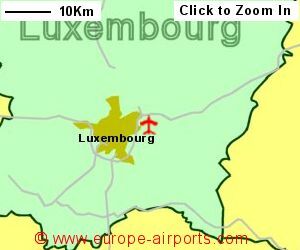 A taxi journey from the airport to Luxembourg central station should cost approximately 35 Euros. Facilities includea restuarant, 8 bars(incl one in Terminal B), 5 shops (Terminal A), VIP/Business lounge (Terminal A), a work area for business travellers (Terminal A), and FREE WiFi Internet access. There are several hotels close to the airport. Approximately 3.6 million passengers used Luxembourg airport in 2017, a 19% increase from the previous year.